I requested this pitcher for Christmas because a friend has one and I’ve tasted the fruity water that it produces. It is so good! As you can see in the picture, the pitcher has a “removable infusion rod.” That’s a fancy name for a ventilated cylinder that holds the fruit. You fill it with fresh or frozen fruit, screw it onto the lid and lower it into the full water pitcher. The fruit then begins to compress and flavor the water. Supposedly, you can keep the fruit in the pitcher for 7-10 days (refrigerated, of course). Here is a recount of my first time using it. Day 1 - I bought a bag of frozen fruit at the grocery store (raspberries, blueberries and strawberries). 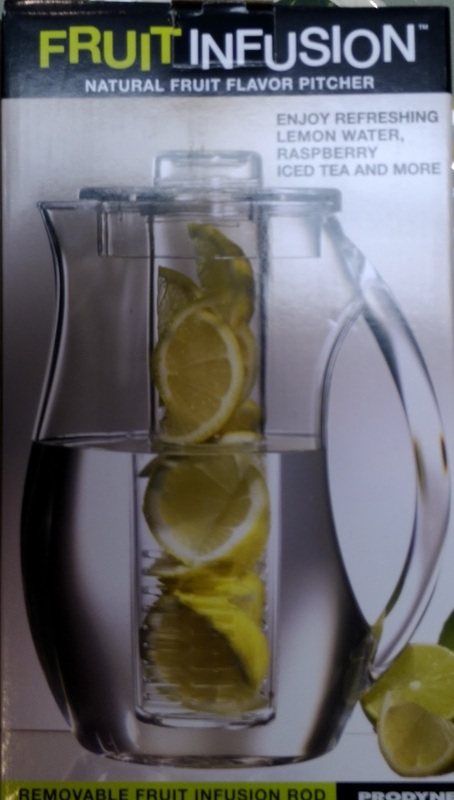 According to the directions, I filled the infusion rod to the top with fruit and filled the pitcher to the handle with water. By the way, I used filtered water from my Britta water pitcher to get a better flavor. Day 2 – The water was barely pink. I tasted it and it had a hint of fruit, no more. 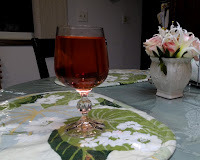 Day 3 – The water now had a tint - that of white zinfandel wine. I poured some into a water glass and tested it. It had a delicate fruit flavor, but more than the day before. Day 4 – The water was a deeper pink. I poured some into a wine glass. See how clear it is? Very fruity! I filled a special water bottle, charged it with my Soda Stream and took it to bed. Every time I unscrewed the cap, the aroma of strawberries escaped the bottle. Day 5 – By now, the fruit was thoroughly compressed and most of their color was gone. I emptied the contents of the pitcher into two Soda Stream bottles and a wine glass for myself. The strawberries had taken over the flavor and it was almost like drinking a glass of juice (minus all that sugar). Was my first experience a success? Absolutely! The fruit didn’t last as long as the directions claimed, but I am very satisfied with the results. I plan to keep using frozen fruit, but next summer, when I have fresh strawberries from my own garden, I hope to produce even tastier water. 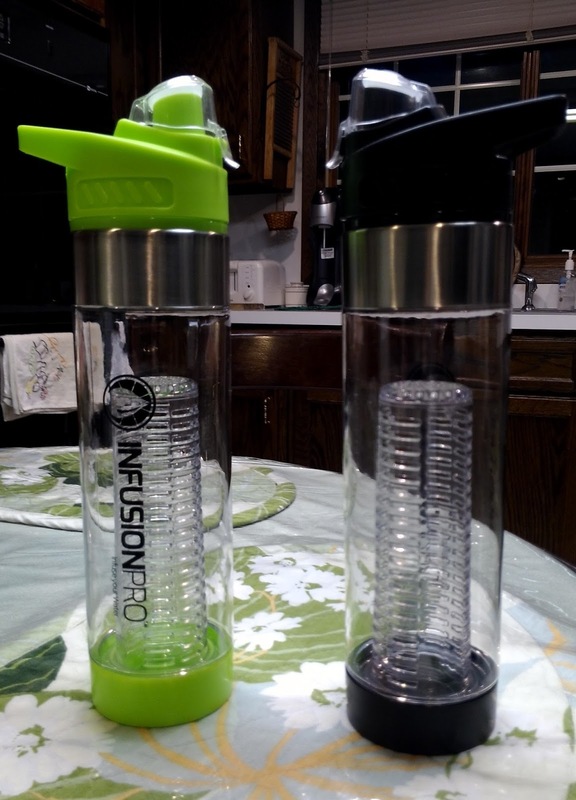 Next I’m going to experiment with an infusion “water bottle” to take with me when I go out. Denise Devine is a USA TODAY bestselling author who has had a passion for books since the second grade when she discovered Little House on the Prairie by Laura Ingalls Wilder. She wrote her first book, a mystery, at age thirteen and has been writing ever since. She writes sweet romantic comedy and inspirational romance. She is currently writing two series, Forever Yours (Inspirational) and Counting Your Blessings (Christmas romantic comedy). You can visit her at www.deniseannettedevine.com. Want to keep up with news from Sweet Romance Reads authors? Sign up for the SRR newsletter today. It sounds so great I can almost taste it, Denise. Thank you for sharing your results! Sounds wonderful. I've heard good things about fruity water, mostly with lemons. Now how cool is this? Sounds like such a good idea.